The Picture Postcard Workflow is more than a decade old, but it never really caught fire until the time of Photoshop CS5, when an imaginative Adobe product called Configurator allowed us to store actions in the form of a panel for easier use. Even in those prehistoric times, PPW was highly automated, so assembling its tools into such a panel seemed a natural move. In September 2011, we shared one with friends and classes. The word spread and adoption was rapid, particularly in Italy. After one revised release to correct some bugs, in March 2012 we saw version 2.0 and the enormous impact of the participation of the panel’s architect today, Giuliana Abbiati. Now many of the actions were scripted and could take user-defined preferences. Important options were added to the Bigger Hammer action, and several others were refined. 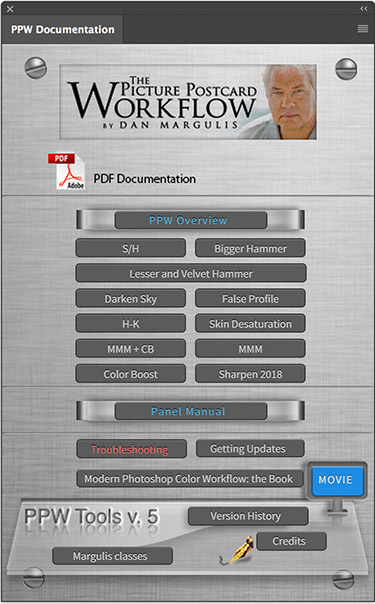 The gains in productivity from this panel were a big factor in the decision to publish Modern Photoshop Color Workflow, which came out in 2013––shortly after panel version 3.0, which added many new features, including revamped sharpening, scripting of all remaining actions, new Color Boost and MMM capabilities, and logical grouping of layers with informative names. Giuliana built on these capabilities with a 3.3 release later that year. Plans for the future speeded up when Adobe announced new architecture requirements for panels for its CC versions. So, when version 4 came out in October 2014 with the new Lesser Hammer and Velvet Hammer actions, among many other improvements, there was one version for Photoshop CC2014 and another for the CS apps. Almost every subsequent version of Photoshop CC broke the panel in one way or another, and what with various bug fixes we had many minor updates. Version 4.0.5, released January 2015, is the current version for Photoshop CS6. Version 4.1.1, released November 2016, is the current version for Photoshop CC201x. Or at least they were the current versions until today. It is a pleasure to announce that version 5.0 is now available for download on our free resources page. We’ve been using a beta version for some time. It worked well in an Applied Color Theory class in Atlanta two weeks ago. We’ll be putting it through its paces again in a San Diego class in August. 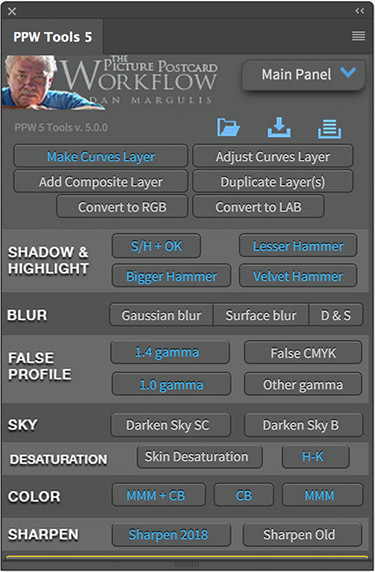 The PPW Tools panel, version 5. Blue type in the button indicates that the script has user-definable options. The panel contains hundreds of pages of documentation, full of sample images that show the strengths of each script. Version 5 has many lesser tweaks and two major additions. First, a Variants functionality permits easy, automated storage of the current version of a file, very useful for those experienced with blending images or those disappointed with the inefficiencies of Smart Objects. With one click, the user decides whether to save the Variant in layered or flattened form, and whether to assign an informative name to it. Each can be reopened as a separate file at any time, or with a single click, all or selected ones can be opened into a single stacked file. The Variants automatically go into a separate folder within the file’s own folder, for ease in deleting all of them when no longer needed. Second, users may now store their own actions for access within the panel itself. An important gain: actions run from Photoshop’s own Actions panel are equivalent to running each included command separately. Applying a complex action, even by mistake, can therefore flush the entire image history. However, the same actions, when stored in and run from the PPW panel, are seen as a single history state: a Command-Z will undo the whole thing. We supply a starter kit of six custom actions, including useful variants of both the Color Boost and the MMM scripts. Several of the scripts in the panel have enhancements. The MMM, CB, and MMM + CB each now feature a layer that restricts changes in greens and another that restricts them in blues. The user can increase the restriction, decrease it, or eliminate it altogether. The Sharpen 2018 script implements new defaults. Unless you choose otherwise, it limits or prevents sharpening of blue objects, useful for those whose work commonly involves skies. Soften Shadows does what it says. The two come as layers, so it’s easy to limit their effects to certain areas. Sharpen 2018 also assigns halo width based on file size. As with all the extensive sharpen options, this can be overridden either permanently or on a case-by-case basis. All documentation has been updated as needed, as has the panel manual. The panel carries these PDFs, which amount to hundreds of pages, onboard where they are accessible through the Documentation subpanel. The panel also has an onboard color reference, which gives suggested LAB values for a variety of common objects. Keeping the panel up-to-date and adding these improvements has been a huge effort for Giuliana, who deserves the thanks of every user. We hope that we will continue to progress, and that you will get lots of use out of this version in the years to come. I have used the new panel and am extremely happy with it. The additions to the panel are going to be extremely useful. One danger most users will just use each function automatically, the panel actually gives one tremendous control in your final image appearance, and it is extremely worthwhile to Alt Click on the action to open the Options. To all who have worked on it Many Thanks especially to Giuliana and congratulations to Gerald in getting some of his actions included. Thanks Kirk for the feedback and the kind words. If you can’t buy Channels Power Tool in China, you can check with the author to see if you can put this plugin free. Thank you! My email: 1871180590@qq.com. is looking forward to it. Or can you give Giuliana Abbiati contact information? Dear Mr Margulis, i am very interested to buy your book in digital format, please let me know if available. Thank you for all the efforts you all put into this wonderful panel! It is a Photoshop addition I don’t want to miss any more. It has saved me hours of work. Paredes, there is no authorized digital version of this book available. René, this is very kind. It does become difficult to continue to update and support a piece of freeware; comments like this are what make the work worthwhile. Dan, I am interesting in buying your “Photoshop LAB Color” book, however, it retails on Amazon for about $4000 new, and $400 used. I am sure it is an excellent book, but $4000 is a little steep :). Any idea if or when this book will be available again at normal pricing? Aram, I don’t have a source of these books. With the economy for book publishing what it is, I do not expect the book to be reprinted. I agree that $4,000 (or even $500 used) is not an attractive price. One possibility is that the first edition was a huge bestseller so there are many used copies available, shouldn’t cost even $10. Some of it is outdated but on the whole it is a good introduction to LAB. Please see the installation instructions contained in the download. Double-clicking the .jsx file brings up Extendscript, which cannot install all necessary components. The file needs to be drag-dropped onto the Photoshop CS6 icon, not double-clicked. Adobe Extension Manager no longer has any role in the process. which has many suggestions for common problems. How can I access PPW template and actions for CC 2018? For chapter 3, while making color changes would it not be simpler to change mode to LAB and make changes rather than make changes in RGB? PD Singh, it would not be simpler because LAB always requires the use of a mask for this type of correction and RGB does not. However, there is no reason to avoid doing it this way: PPW simply says that any color problem should be addressed at this point and does not demand that it be done in any particular way. Nowadays after completing my first stab at a correction I always do a second version very quickly, to see if some type of favorable blend of the two is possible. In doing this, although I am trying for a good result, I am also trying to vary from my first approach because I want a slightly different appearance. Often for this second version I will in fact do the step you refer to in LAB. I’d say that the RGB is likely to be better, and if not at least as good, but the LAB version is better frequently enough to make it worthwhile. ho scaricato ed uso il PPW versione 5 con molta soddisfazione. Per quanto riguarda la documentazione ho qualche difficoltà con l’inglese. C’è la possibilità di poter avere la documentazione in italiano? Sebbene il team che ha sviluppato il pannello sia italiano, come molti utenti, sono io che aggiorno la documentazione. La traduzione richiederebbe più tempo di quanto possa essere giustificato per un’estensione che è freeware. Vorrei che fosse una risposta più soddisfacente, ma abbiamo un esercito di volontari e dobbiamo stare molto attenti a quante battaglie gli chiediamo di entrare! “the steeper the curve, the more the contrast” does it apply for levels adjustment as well when it comes to setting the Whites? Moving the white in levels looks similar to moving the curves master white point thus steepening the contrast. If all you are doing is adjusting the endpoints then curves and levels are the same. If you are adjusting the midpoint of levels it is no longer the same although the effect is similar; the curving algorithm is different. And of course with levels we are limited to three adjustment points, which is why curves is in principle the better option. 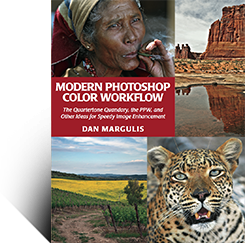 Hi Dan – I bought the PS workflow book, and use the PPW panel as part of my PS workflow (thanks! samples on my flickr acct). I was going to buy the LAB color book, but went to various booksellers and it’s astronomically priced now for used copies. Do you think you will do another run of them? They used to be $50. Thanks again! Dave, the publisher evidently did not think it worthwhile to reprint and even if they were to give me permission to do it myself I don’t think I’d second-guess them. I agree that the online prices are astronomical and regret I don’t have any copies of my own to offer. Note that used copies of the first edition are readily available and cheap. Thank you, Dan. I’m guessing that there are some large differences between edition 1 and 2 – please correct me if I’m wrong. I’ll probably wait and keep watch on the prices which will no doubt fluctuate. Cheers! could you suggest a way to de-saturate shadows and highlights? Is that possible in your tools panel? The only way I know is to convert to CMYK where I have control over the Black channel for shadows (and subtract cmy from it with selective color) and Cyan to tint the highlights (which means that coupled with skin tones, it leads to de-saturated highlights in skin). Marameo, as a general rule if there is something wrong with the highlights and/or shadows then the same defect is found to a lesser extent in other tonal ranges. Therefore normal color-correction curves should be the first approach. Of course there are certain cases where the rest of the image seems correct and something about the highlights and/or (less commonly) the shadows seems grating. Yes, you could use Selective Color plus a mask to, say, desaturate greens in the shadows. No need for CMYK, the command works in RGB, you would just add Magenta to Green, or use the Hue/Saturation command to do almost the same thing. However when this happens to me it is usually just a small area, so to save time I just set the Sponge tool to Desaturate and run it over the offending area. I don’t think anyone can tell that I didn’t use a more elegant method. I completely understand your reluctance to self-publish. At the same time, I would think chances could be excellent to do something meaningful and exciting for everyone. Perhaps a “Special Edition”, printed in Hexachrome (as one idea), on high-quality paper. The recent “price discovery” (of supply and demand) suggests this could be a hit at e.g. $100 – $200 each. If Kickstarter or similar could work for you to safely proceed with such a plan, it seems like there should be 500 people (just to float a conservative number) out there to make this a viable and worthwhile endeavor. I hope you find these ideas of interest. Thank you for offering your readers this forum to communicate with you. More importantly, I wish to thank you for your inspirational and influential work. It has helped me immensely. I’ve replied to you offline. I can’t download and install Variants Manager. After this website was ordered in https://cc-extensions.com/products/variantsmanager/, it is still the original webpage. I don’t know what happened. 时间去那儿了, the Variants Manager has not yet been released. Dan Margulis - 45 days 23 hours : Peter, I’ve replied offline. Dan Margulis - 45 days 23 hours : 时间去那儿了, the Variants Manager has not yet been released.